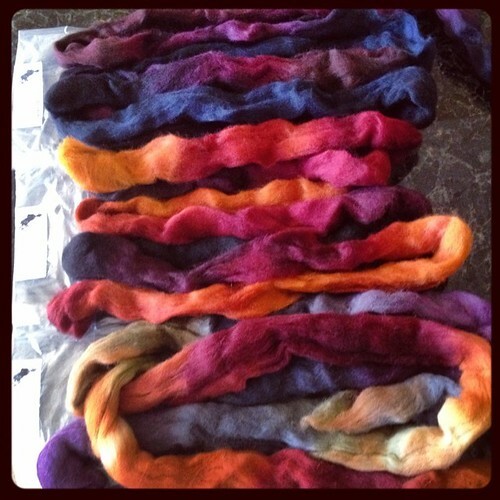 The Tour de Fleece is coming! It runs concurrently with the Tour de France, with spinners challenging themselves to spin every day of the Tour. This rather goes hand in hand with the Spin365 project, which I have rather fallen a bit by the wayside on, though I have probably spun more this year than I have ever spun and am starting to run out of room in my handspun yarn cubby as far as storage space goes. Earlier this year, I spun up a bunch of yarn, then didn’t spin for a month while I actually proceeded to knit with all that yarn I made – that worked out quite well – I’m contemplating doing that for the remainder of the year, alternating spinning and knitting with my own handspun to try to get my stash a bit more under control. Do you have plans for the Tour? Pretty combination. I can’t wait to see what it looks like spun up!